In today’s fast-paced business world, it’s incredibly important for businesses to do all they can to protect their bottom lines and increase profitability. Companies must constantly be looking at ways to improve their processes and company procedures to ensure they are remaining competitive within their industries. For companies that utilize scales, this is especially important. The scale industry has seen a number of changes over the past several years that allow companies to generate faster and more accurate readings and also free up personnel to focus on more complicated work tasks. Arlyn Scales has been leading the scale industry for over 30 years. While we’re always focused on producing high quality scales, we’re also always looking for new ways to innovate our products to revolutionize the entire scale industry. With our scales being manufactured in our Long Island, New York factory, we’re easily able to make quick changes that result in more satisfied customers. 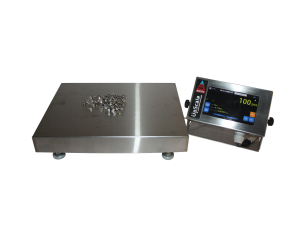 By manufacturing our scales in-house we also offer to cut down on costs by selling and shipping directly to our customers, cutting out the distributor model that is used by so many other scale manufacturers. By cutting out unnecessary dealer markups, we’re able to deliver a scale that is superior in terms of the latest technology all at a price that is equal to if not less than our competitors’ offerings. Because of our focus on the latest in scale technology, our scales come with great options that help our customers significantly increase their productivity. One of our best automation options on our scales is our set point controller. This controller allows you to program as many as 8 weight values into your scale. These values can then be used to provide automatic filling as well as programmable logic controller functions. For instance, let’s say that you were looking to add liquid from a drum into some type of container on our 320M platform scale. By programming 2 set points, one for a reading near your target weight and another for the actual target weight, your controller can operate a pump at full speed through a solid-state relay until it precisely reaches the first target value. At this point, the controller can run a secondary pump through a solid-state relay at a trickle speed to ensure that all of the material has been removed from the drum. You can also use other set point values for mixing and for chemical compounds to come up with recipes to store in the set point controller for long term use. Another way that our customers use our set point controller is by creating an automatic sorting system. You can use our scales to weigh an item that is stored in the set point controller and then activate a sorting system via solid-state relays to properly sort items by their weight. Our controllers can also notify customers when containers are almost empty and require filling. As you can see, the set point controller adds a whole host of versatility to our feature filled scales. Weight data generated from scale readings can easily be analyzed on your computer to ensure that nothing was recorded incorrectly. It’s also easy to export weight data from your scale into analytical applications like MS Excel or MS Access to view data to determine costs and trends. Our scales offer a variety of connectivity options to ensure that you’re able to do what you need to do with your valuable weight data. USB – Universal Serial Bus or USB is by far, the most common interface used in computers and peripherals. USB ports exist on almost every piece of equipment that could interface with a computer. Our scales are no different. You can connect a USB cable from your scale to a laptop or PC and then control and monitor your scale. We offer our USB Remote Software that can be installed on your computer for easy access to your scale. This software also allows you to export weight data from the scale into a variety of formats that can easily be analyzed on your computer. Ethernet or WiFi Connection – Most businesses have an internal network that connects all of the computers and devices across the entire company. Our scales offer an Ethernet network connection allowing you to easily connect your scale to your existing corporate network to access your scale data. If you’re unable to connect your scale to your network via a hardwired connection, you can also use a WiFi connection to communicate with your scale through our Remote Indicator Software. This will then allow you to access your scale and weight data from anywhere, as long as you have an active Internet connection. This allows you to monitor your scale data from all over the world without having to be in your office. Datalogging – Many of our customers are using our scales in areas that do not have direct connectivity to computer networks. That’s why we’ve added a datalogging function to our scales. This allows our customers to connect a simple USB flash drive to the scale’s USB port and then download weight data to be analyzed later when access to a computer is available. The data is saved to a flash drive in CSV format, which is easily accessible by a number of computer programs such as MS Access and MS Excel. At Arlyn Scales, we work extremely hard to provide the highest level of support to our growing number of customers. Our entire support staff is highly experienced with our extensive product line and can easily offer advice based on your unique needs. Feel free to reach out to our team today at 800-645-4301 or via email through our online contact form.